Éadach is a range of limited edition prints from designer Sara O’Neill, inspired by her grandmother’s stories, Irish myth and legend and her native north coast. Since graduating from the University of Ulster in 2004 with a BA Hons in Fashion and Textiles, Sara has worked in the commercial fashion and advertising industries as a stylist and an illustrator. 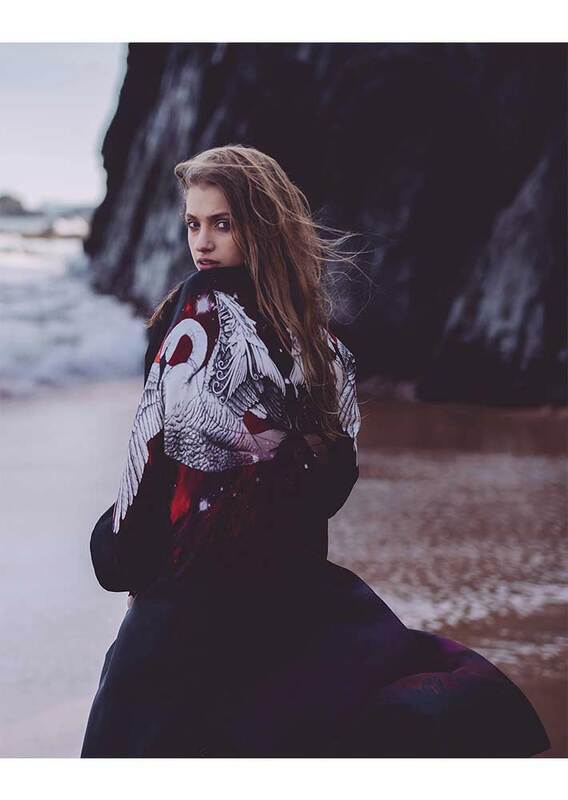 In 2014 she combined both of these disciplines to create Éadach, featuring hand drawn illustrations printed on silk to create richly coloured contemporary prints inspired by Ireland’s darker stories and history and heritage of strong women, luxury with a rock n roll bohemian edge. She is passionate about creating beautiful, versatile, hardworking pieces that can be styled to create different garments and add luxury to every day. The range consists of scarves and garments which are handmade in Belfast. Sara wants to move away from fast trend led fashion to create wearable art that will relevant for many years to come. Éadach has been showcased at Brown Thomas Create 2016 and 2017, and in the Marvel Room 2016 and 2017. Sara has been shortlisted in the Irish Fashion Innovation Awards 2016 and 2017 and was named as Woman of the Year in Fashion at the Belfast Telegraph Awards 2016. Recipient of the Creative Industries Innovation Fund from the Arts Council NI 2014.